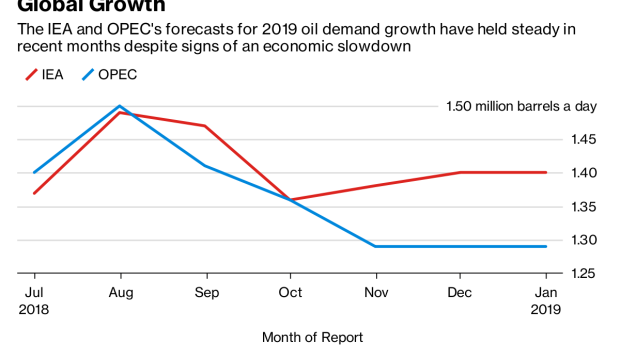 (Bloomberg) -- Global oil demand remains on course to be stronger this year than in 2018 as a boost from lower fuel prices counters slowing economic activity, according to the International Energy Agency. After slumping in the fourth quarter, oil prices “will provide some stimulus to demand,” said the Paris-based agency, which advises most of the world’s major economies on energy policy. Still, as “the mood music in the global economy is not very cheerful,” it acknowledged the outlook could change. Crude prices remain almost 30 percent below the four-year peak reached in October amid concerns over economic growth in China and the U.S., the world’s two biggest oil users, who remain locked in a trade dispute. To prevent markets tipping into oversupply, the OPEC cartel and its partners have announced substantial production cuts. Oil consumption will expand by 1.4 million barrels a day -- about 1.4 percent -- in 2019, slightly higher than last year’s expansion of 1.3 million, the IEA predicted. Brent crude traded near $61 a barrel in London on Friday, having surpassed $86 in October. Faltering manufacturing and slumping exports have stirred concerns that China’s economy, the oil market’s engine of growth for more than a decade, is slowing. A prolonged trade battle with the administration of U.S. President Donald Trump is only darkening the outlook. Output cuts planned by the Organization of Petroleum Exporting Countries and its partners should stabilize world markets, though the process will be slow, the IEA said. To fully implement its agreed cutbacks, OPEC would need to cut by a significant 900,000 barrels a day this month, with its allies reducing by a further 370,000. While OPEC’s biggest member, Saudi Arabia, has made an early start on production cuts, unplanned losses have steadied in fellow members Iran and Venezuela. At the same time, the shale-oil boom is continuing unabated in the U.S., which by the middle of the year will be producing more crude than either Saudi Arabia or Russia is able to. Production in the U.S. will rise by 1.3 million barrels a day this year, the IEA said. That’s slower than the record 2.1 million increase in 2018, but the agency pointed out that such rapid expansion had been "unexpected" given that its initial estimate was for growth of less than half that amount. Refiners around the world also face a challenge this year as the industry adds 2.6 million barrels of daily processing capacity, the biggest increase in the records of the agency, which was set up in the 1970s. “By the end of the year, all industry players, upstream and downstream, may feel as if they have run a marathon,” it said.